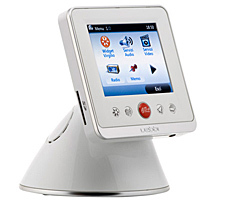 The new touchscreen multimedia home device from Telecom Italia features TTS from Loquendo. Loquendo announced that Telecom Italia has launched Uebbi, a innovative touchscreen multimedia device providing all kinds of information, including audio content generated by Loquendo’s text-to-speech (TTS). Uebbi provides multimedia Web content via Alice broadband connectivity and a huge choice of widgets offering news services, sports news, latest market news, and weather forecasts read via Loquendo’s TTS. Uebbi is also an Internet radio, with high quality audio and video—all via wi-fi, without the need for a computer. USB and SD connections make Uebbi an MP3 player and photo viewer. Uebbi can accompany users throughout the day, in the kitchen or office, at home or at work – with an alarm clock to wake users in the morning and voice memos to remind users about appointments during the day. "We are proud that Loquendo speech technology has been chosen for Telecom Italia's stylish, next-generation consumer device," said Paolo Coppo, Loquendo vice president for marketing and business development. "It is an example of yet another innovative context of use for Loquendo TTS. By using speech technology, we have effectively solved the business challenge of vocalizing massive dynamic content in real-time, which would have been impossible to do with a voice talent."